You can make a 5-Star Deee-LICOUS Gourmet meal with this recipe! It’s “gourmet” because it tastes so good and is soooo healthy. And it’s SO EASY to cook! This recipe is Perfect as a complete lunch meal or as dinner with a fried egg and grilled chicken. !! NOTE: If you’re using canned vegetables, wash and rinse them first to get rid of the salt and preservatives !! 1) Prepare the vegetables. Chop the yellow onion and red capsicum. 2) Rinse RESTORE™ Bolivian Quinoa in cool water. 3) In a pan/wok add the quinoa and liquid (water OR chicken broth OR vegetable broth OR Beef Stock). 4) Then, add the black beans, corn, yellow onion and red capsicum. 5) Stir the ingredients to mix them well. 6) Add the seasonings (chilli powder, cumin, salt and black pepper. 7) Close the lid and bring the ingredients to a boil. 8) Once it has reached a boil, reduce heat down to “LOW” and let cook for 15 minutes. 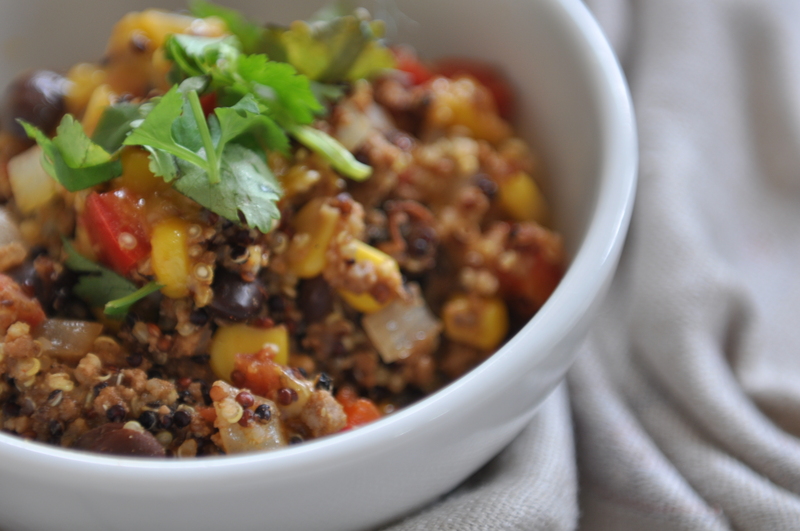 9) IF YOU WANT TO ADD MEAT: In a separate pan, cook the minced beef, remove top from Quinoa pan and add the beef. Stir well and replace the lid. 10) After cooking Quinoa 15 minutes, turn off the flame and open the lid. 11) Sprinkle the cheddar cheese on top and replace the lid. Leave for 5 mins until the cheese melts. 12) After 5 minutes, serve the quinoa. To make nicer add with some coriander for garnish.